Hortus Camdenensis | Gladiolus angustus L.
A narrow-leaved gladiolus with up to 5 linear leaves, to 75cm long, and a slender, rarely branched flower stem, to 75cm, bearing up to 20 long-tubed, funnel-shaped, dingy-white to cream or pale yellow flowers, sometimes pink tinged, with a heart-shaped carmine-purple blotch on the lower segments. [RHSD, CECB, Hortus, Grey]. ‘Cultivated by Miller in 1757. A native of the Cape, and seems to have been one of the first denizens of Europe in this family. Has been confounded with the Gladiolus angustus of Thunberg . Is closely allied to a species that we have never yet met with in any collection, though cultivated by Miller, viz. the Gladiolus involutus of De La Roche, and figured by Miller, tab.236. fig.1. - probably no longer existing in this country. The specimen from which our drawing was taken flowered in unusual perfection at Messrs. Grimwood and Wykes, Kensington, in the month of June. Propagates with the greatest facility both by seed and offsets, and is one of the commonest, though seldom seems to flower so perfectly as the present specimen, except from recently imported bulbs.’ [BM t.602/1802]. 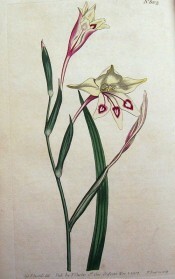 Andrews' Botanical Repository figured Gladiolus angustus var. minor. [ABR pl.589/1810] Probably introduced to Britain before 1740. [Beal]. Listed in all published catalogues [B.122/1843]. Present in the gardens since at least 1831 as Gladiolus trimaculatus. Seeds or bulbs of this were presented to the Sydney Botanic Gardens by Messrs. Macarthur in that year. [RBGS AB1]. Possibly later obtained from Veitch’s Nursery, brought out from England by Captain P. P. King in 1849. The plant list entry is marked with a ‘x’, which signifies that Macarthur believed it to be an old inhabitant of the colony. There is also a question mark next to the entry. [MP A1980-3]. Gladiolus angustus Thunb. (c.1800) = Gladiolus undulatus L. which see. Gladiolus angustus Jacq. ex Thunb. (1807) = Gladiolus hastatus Thunb.